Being locally relevant is key for any brick and mortar business, and adidas worked with its agency iProspect to leverage mobile’s power to reach local customers. They recognized that in order to build an effective mobile presence, they had to pivot their thinking to understand how mobile drives value beyond mobile commerce, particularly in-store sales. “If we look at a 1:1 response or 1:1 measurement of what our media budget is driving on a mobile site, we're missing a big part of that picture. As performance marketers, a lot of the times we look at direct responses, and what mobile is requiring us to do is redefining direct response," says Kerri Smith, head of mobility at iProspect. We live in a multi-screen world where people are constantly connected and moving seamlessly across devices. Not only do mobile devices keep us connected anytime and anywhere, but they play an increasingly important role in shopping, both online and offline. With mobile, consumers no longer just take linear paths to purchase that begin and end on the same device. Instead, there are a range of customer journeys - like starting on a smartphone and ultimately buying in-store, continuing on a different device, or making a phone call. , we upgraded call extensions and sitelinks with several new features to help you reach customers in more relevant ways across these varying contexts. Mary further segments her data with the "This Extension vs. Other” feature. Here, you can see that two clicks occurred specifically on the “Running” sitelink while 137 clicks occurred on the other parts of the sitelink, like the headline. , buy and manage successful campaigns across all formats and screens. Today, we’re announcing a series of improvements that aim to help you accomplish this. Build robust interactive in-stream video ads in DoubleClick Studio, and use the new IAB rising stars formats to turn your standard 15-second TV commercial into a longer, engaged viewer experience. Check out our demo below! Buy video inventory in real time on DoubleClick Bid Manager, and access more mobile and video inventory on DoubleClick Ad Exchange. With DoubleClick Bid Manager (DoubleClick’s DSP and real-time bidding platform), you’ll soon be able to programmatically buy and report on your video campaigns in the same place as the rest of your display media. We’ll be offering a video beta for select clients in the coming weeks. Contact your sales rep for more info. DoubleClick Search (DS) will be supporting AdWords enhanced campaigns over the next few weeks, to help you better reach your customers across locations and devices. By using enhanced campaigns through DoubleClick Search you additionally gain holistic measurement, a streamlined, easy workflow, and better bid decisions based on your Floodlight conversion data. Track all the metrics for your Trueview in-stream video ads in DoubleClick for Advertisers (DFA). Thanks to one new trafficking tag, even though the ads aren’t served through DFA, you can still pull the metrics back into DFA and compare them with the rest of your placements. With an integrated platform of DoubleClick products that work better together, you not only benefit from top-notch individual products, but you also benefit from the efficiencies, insight, and performance gained when all of your campaign’s assets and data exist in one spot. For more information about our DoubleClick platform, visit our website. In today’s digital marketing landscape, it’s becoming increasingly crucial for campaigns to span multiple screens and ad formats in a cohesive way. Online video is the fastest growing form of display advertising, projected to grow 2.5 times to $6.5B by 2016. And total mobile ad spend is projected to grow ~4.5 times to $22.4B in 2016, representing ~35% of all digital ad spend by 2016. Given these transformations, we are working hard to build best-in-class tools for our integrated platform that make it easier for you to create, buy and manage successful campaigns across all formats and screens. Today, we’re announcing a series of improvements that aim to help you accomplish this. This past holiday season, homes were aglow with the twinkling lights of large screens (like laptops, desktops and tablets) and mobile phones alike. In our holiday consumer survey, conducted in partnership with Nielsen, we found that consumers relied on their devices more this holiday season, moving fluidly between devices based on their setting and context. 63% of consumers frequently used more than one digital device to shop for gifts this holiday season, and 67% of consumers believe that “having access to multiple devices makes it easier to shop”. Another important finding was that more screens means more shopping. People using one device to research and shop made online and offline purchases across an average of six product categories (like electronics, apparel, auto parts, etc), while those that used two devices purchased across eight categories, and people who used all three devices shopped across an average of nine categories. In many cases, consumers discovered a business on one device, for example on their smartphone while in a store, and would then engage further with that business on another device at a later time. We saw that 65% of holiday shoppers were frequently engaging in this sequential behavior throughout all of their shopping. 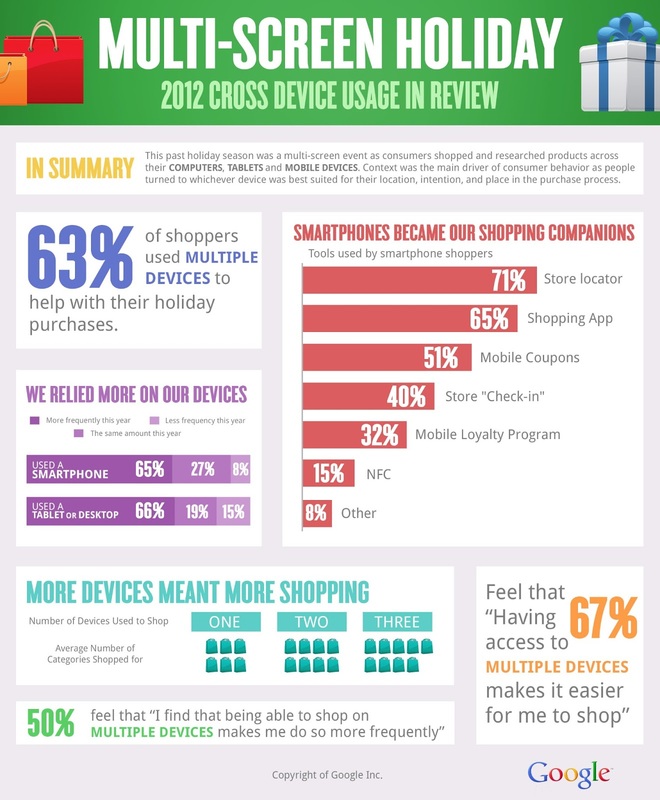 For multi-screen shoppers, different devices fulfill specific objectives. For example, smartphones were the preferred device for contacting or navigating to a business with 71% of shoppers using a store locator on their phone, while 82% of shoppers used a larger device like PC or tablet for making online purchases. These same multi-screen trends carried us into 2013 as people used multiple devices to make and keep new years resolutions. 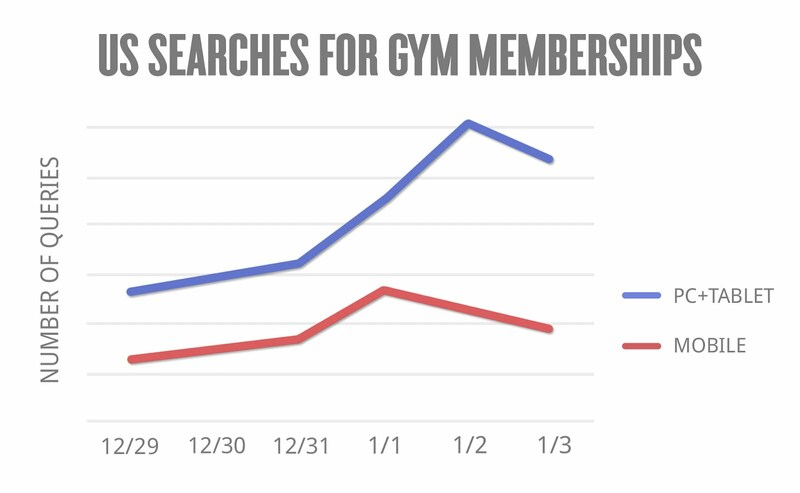 Looking at search query behavior around New Years, we saw an interesting twist on the classic resolution of becoming more healthy. People used their smartphones on January 1st to look up things like gym memberships, diets, or cleanses, and then the following day, searches for those same words spiked on tablets and desktops as people continued their research on these devices at home or at work. This behavior demonstrated the growing trend of using multiple devices in combination to help make everyday decisions. This multi-screen consumer behavior doesn't fade away with the holiday. In fact, better understanding how people searched, shopped and seamlessly moved between multiple screens during the holiday can give us insight into this new constantly connected consumer. So what can businesses do about it? One good answer is to think context. All these new search patterns have created new opportunities for businesses to be more relevant to people’s context. Context signals like time of day, general location, and the kind of device a person is using, provide powerful insights into what they may be looking for and where they are in the buying cycle. Within AdWords, advertisers now have the opportunity to use enhanced campaigns, which help them reach people across all devices with smarter ads that are relevant to their intent and context. Learn more about enhanced campaigns here. This multi-screen behavior will only continue throughout the year. As device penetration grows and multi-screen behavior becomes the norm, those businesses that evolve their marketing strategy along with it will remain the most relevant and see the greatest results. 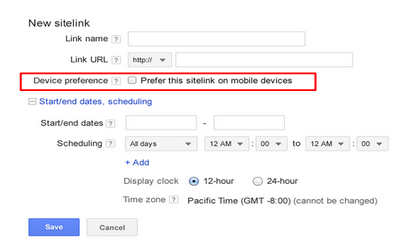 Note: this was posted earlier today on the Google Mobile Ads Blog. To ensure that your products remain eligible for promotion on Google Shopping, we’ve built an easy way for you to create Product Listing Ads. You’ll be able to create a new AdWords account in Merchant Center if you don’t already have one. Set a daily budget and one single maximum cost-per-click bid. You can modify these settings any time after you create your campaign. You’ll be taken to your AdWords account to provide or confirm your billing information. With the recent launch of AdWords enhanced campaigns, it’s now easier than ever to promote your products across devices. This is crucial in a world where people are constantly connected and moving from one device to another. We encourage you to upgrade existing product listing ad campaigns to an enhanced campaign with appropriate bid adjustments. On February 13, Google Shopping results in the United Kingdom, Germany, France, Japan, Italy, Spain, Netherlands, Brazil, Australia, Switzerland and the Czech Republic began to transition to a new commercial experience built on Product Listing Ads. If you’re a merchant in one of these countries and you’re currently promoting your products on Google Shopping for free, you’ll need to create a Product Listing Ad campaign to maintain your traffic and presence. You can learn more about this transition in our recent announcement. , you can easily vary your bids across devices, locations, and time of day – all within a single campaign. Example: A multichannel retailer wants to reach people close to their stores searching for “party supplies.” Using bid adjustments, with three simple entries, they can bid 50% higher for people searching up to a mile away, 20% lower for searches on weekdays, and 25% higher for searches on smartphones. In this post and a Learn with Google webinar this Thursday, February 21st, at 10am PST (sign-up here), we’ll look more closely at the new bidding tools and mobile bid adjustments. This Thursday’s webinar will also dive deeper into some of the improvements with mobile ads. With an enhanced campaign, you start by setting default bids that reach all devices. You can then set bid adjustments to increase or decrease your bids for mobile devices and different contexts – like location and time of day. Setting higher bids when and where you’re more likely to satisfy a customer’s intent can boost your ad’s visibility and potentially lead to more visits and sales. Setting lower bids for contexts where your lead quality or average order value is lower can improve your ROI, although you may see fewer visits and lower total sales. 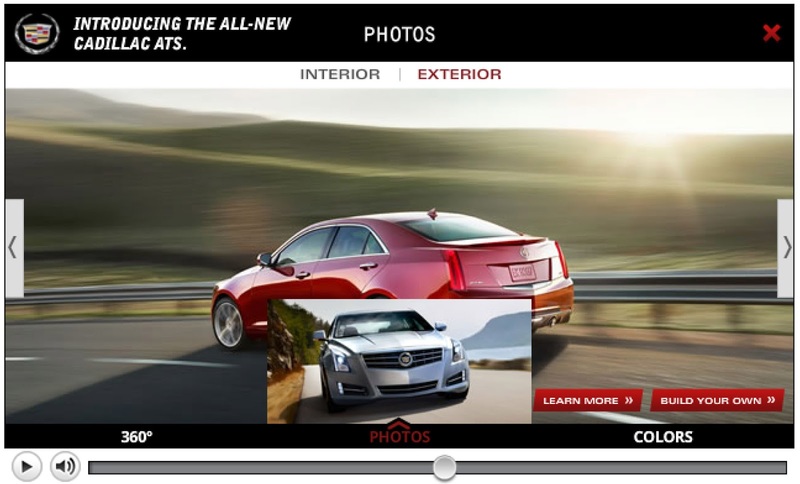 Bidding for devices with larger screens, like desktops, laptops and tablets, is grouped together in enhanced campaigns. We and others in the industry see that users’ search behavior on these larger devices is very similar, and likewise, overall advertiser performance is very similar across these devices. Bid adjustments combine using multiplication. If you set multiple location-based bid adjustments, only the most specific adjustment will apply. Continuing the example above: The retailer’s max CPC bid for the keyword [party supplies] is $1. When someone searches for “party supplies” on a smartphone within a mile radius from the store on Wednesday, then the location, time, and mobile bid adjustments set will apply. So this retailer’s CPC bid for this particular search would be adjusted to $1.50 ($1 x (100% + 50%) x (100% - 20%) x (100% + 25%) = $1.50). The AdWords interface provides a calculator to show you how multiple bid adjustments might combine to affect your bids. People can take a wide range of actions on smartphones. Beyond purchasing directly from your mobile site, customers might call your business, click on driving directions to visit a store, download an app, or even convert on another device later. But traditional online conversion reporting may not show the full consumer journey across devices and can therefore lead to undervaluing mobile. Savvy marketers are looking deeper to consider the full value that mobile brings to their business. Check out how Radio Shack, a large multi-channel consumer electronics retailer, approaches their mobile bidding and measurement strategy here as an example. With an enhanced campaign, you can choose a mobile bid adjustment to influence your ad position, clicks and cost on mobile devices. For a bit of perspective, here are a few of examples of how advertisers set their mobile bids as a percentage of desktop over the course of the last several months (actual CPCs may differ). On average, advertisers in the Australian retail sector set mobile bids to 103% of desktop. On average, advertisers in the US real estate sector set mobile bids to 91% of desktop. On average, advertisers in the Canadian travel sector set mobile bids to 88% of desktop. With each campaign you upgrade to an enhanced campaign, you’ll see the estimated change in impressions, clicks and cost depending on your selected mobile bid adjustment. The suggested bid adjustment shows you how similar advertisers bid on mobile compared to other devices. Experienced search marketers know that bids are one of many factors that influence overall campaign performance, along with keywords, ads, extensions, and landing pages. So after setting a mobile bid adjustment, periodically measure your results and make changes as needed to better meet your campaign goals. We want you to succeed with AdWords, so we’re very interested in hearing your feedback. As you begin using enhanced campaigns, please share your thoughts using this form so we can continue to improve the product. Today, people are constantly connected and searching from all kinds of devices. Advertisers are looking for ways to reach people with ads that are relevant to their context, like their location, the time of day and the device they are using. With an enhanced campaign, you can easily vary your bids across devices, locations, and time of day – all within a single campaign. It's the first Anniversary for the AdWords Community. Let's celebrate in style! It's our first anniversary and we want to thank you! A year has passed since we launched the new English AdWords Community website on the February 14th. It’s been exciting and it’s certainly been emotional, but wow…what a year it’s been. We’re immensely proud of what we’ve achieved together with you in the past 12 months and we’re even more proud of how the AdWords Community has developed. The AdWords Community became an important place for AdWords customers globally looking for support and guidance they need to grow their ROI, their sales and their overall online businesses. That’s all down to the AdWords Top Contributors and all members of the AdWords Online Community. So, a personal ‘thank you’ to each one of you for making this past year so exciting. We have so many exciting things planned for this year to add even more value to our AdWords Community, so please stay tuned! But now, let’s all raise a glass and say one big “Happy first anniversary to the AdWords Community”. To celebrate in style, we’ve gone a little birthday crazy and prepared a small surprise for you. If interested, please visit also our global Communities: Spanish, Portuguese, German, Russian, Italian, French, Traditional Chinese, and Polish. continues to grow (now available internationally in 15 countries), our AdWords Premier SMB Partners have asked us to make it easier for them to tap into AdWords Express for their clients. We’re happy to announce that starting today, these partners, along with agencies and other third parties, can create and manage AdWords Express accounts at scale through My Client Center (MCC). Using AdWords Express via MCC can save agencies and other third parties time and overhead by eliminating day-to-day management for local, small- and medium-sized businesses (SMBs). AdWords Express complements existing AdWords services provided by agencies today by offering them a new option to help SMBs get started quickly with online marketing. Third parties can now create new accounts by simply selecting ‘AdWords Express’ through the MCC. Get more details and instructions on using AdWords Express through MCC in the AdWords Express Help Center. For more resources on My Client Center and other tools to effectively manage large accounts at scale, visit the AdWords Help Center. As AdWords Express continues to grow (now available internationally in 15 countries), our AdWords Premier SMB Partners have asked us to make it easier for them to tap into AdWords Express for their clients. We’re happy to announce that starting today, these partners, along with agencies and other third parties, can create and manage AdWords Express accounts at scale through My Client Center (MCC). show you how users search for products before converting, allowing you to make better informed decisions in AdWords. Now, we're making it easier than ever to incorporate Search Funnels data into your everyday optimizations by introducing new Search Funnels columns that you can simply add to your campaign, ad group, keyword and ads tabs. You should see this feature available in your account within the next couple of days. If you’ve enabled conversion tracking, you’ll be able to see a new section within the column customizer for Search Funnels. This section will allow you to add columns for many common Search Funnels metrics, such as assist clicks, click assisted conversions, and assist impressions. Find keywords that are best at assisting conversions - Look for keywords with low conversion rates and a high click-assisted conversions / last-click conversion ratio. These keywords contribute significant conversion assists, meaning they are important early in the buying cycle as they drive visitors who are still researching your site. Consider setting up automated rules to increase your bids when conversion assists cross a certain threshold. Also, try creating a separate ad group for these keywords with ads that are geared more towards research than immediate purchase. Pay your assist keywords their fair share - Make sure you’re not underbidding for keywords with assist clicks. You could be missing conversions if your bid management strategy only accounts for last-click conversions. Keywords with assist clicks are in the click path of users who eventually convert, so it’s important to assign value to these keywords. Update your underperforming ads - Consider revising ads that have impression-assisted conversions and have a strong average position. These ads were shown to users who eventually converted but who did not click. Entice potential customers to visit your site with stronger call-to-action phrases in your ad creative. You may also want to consider raising your bids on these keywords if your average position is low to ensure that people see your ads. Using the Search Funnels columns in AdWords has allowed us to both improve the volume of sales and efficiency that AdWords delivers. By using these columns, and in particular the ratio of assisted conversions to last click conversions, we are able to identify and value keywords that play an important role in the upper funnel. Now knowing their importance, we improved our bids for these keywords, and have seen overall conversions increase by 30% and our ROI increase by 16%. For more details on how to enable Search Funnels columns in your core reports, visit our help center. Search Funnels show you how users search for products before converting, allowing you to make better informed decisions in AdWords. Now, we're making it easier than ever to incorporate Search Funnels data into your everyday optimizations by introducing new Search Funnels columns that you can simply add to your campaign, ad group, keyword and ads tabs. You should see this feature available in your account within the next couple of days. , which let you more easily adjust your ads and bids depending on your customers’ location, device, and time of day - all within a single campaign. 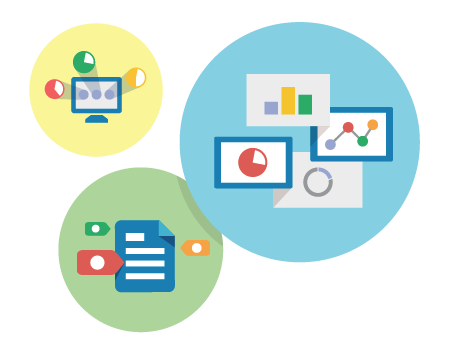 We’ll be hosting several Learn with Google webinars about enhanced campaigns over the next few weeks. This Thursday, February 14 at 10am PST, Sridhar Ramaswamy, Senior Vice President of Engineering, and Jason Spero, Global Sales Director, will provide an overview of enhanced campaigns and Q&A. Please sign up here to attend. Also look for more information and details about enhanced campaigns over the next few weeks here on our blog. Last week we announced enhanced campaigns, which let you more easily adjust your ads and bids depending on your customers’ location, device, and time of day - all within a single campaign. originally appeared on the Google Analytics Blog. We’ve heard you loud and clear that getting started on Google Analytics can be challenging. It’s such a robust tool with a variety of reports, filters, and customizations that for a new user it can be overwhelming to figure out where to look first for the data and insights that will enable you to make better decisions. For more advanced users it can be time consuming to build out different variations of reports and dashboards to get the clearest snapshot of your performance. That is why we’ve created the Google Analytics Solution Gallery. The Google Analytics Solution Gallery hosts the top Dashboards, Advanced Segments and Custom Reports which you can quickly and easily import into your own account to see how your website is performing on key metrics. It helps you to filter through the noise to see the metrics that matter for your type of business: Ecommerce, Brand, Content Publishers. If you're not familiar with Dashboards, Advanced Segments and Custom Reports, check out these links to our help center for detailed descriptions on how they work and the insights they can help provide. Here are a few examples of the solutions that can be downloaded into your Google Analytics account to see how the analysis works with your data. Note: You should already have an Analytics account with data to have these solutions be effective for you. 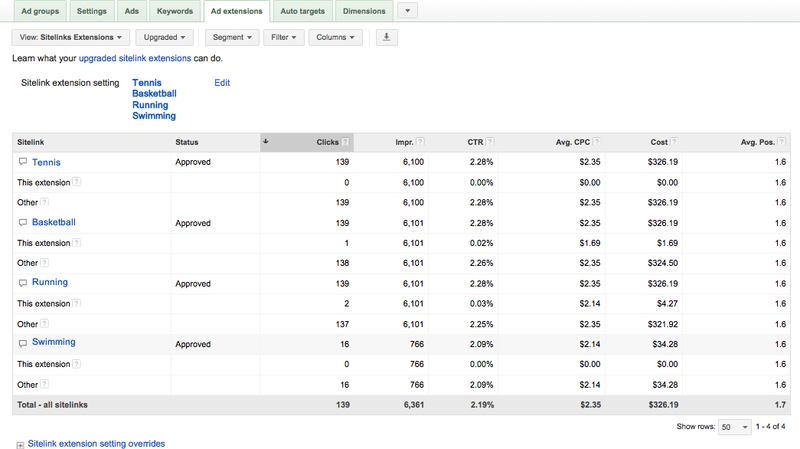 AdWords (Google CPC) Performance - Use this segment to analyze the performance of AdWords traffic. You can also create segments to compare your CPC traffic from other sources and compare performance between them. 6+ Keywords - Learn which long-tail keywords with more than six words your visitors are using to find your site. Then refine your pay-per-click ads and SEO to drive more qualified visitors to your site. Paid vs. Organic Search Performance - Do you know the behavioral differences between users who click on your paid ads and those who click on your organic search results? Use this report to understand the different ways they interact with your site and how to improve performance based on these findings. How do I add these to my account? We’ve designed it so it’s easy to get started. Simply go to the Google Analytics Solution Gallery, pick from the drop drown menu the solutions that will be most helpful for your business. Select from Publisher, Ecommerce, Social, Mobile, Brand, etc.. . Hit “Download” for the solution you want to see in your account. If you are not already logged into Google Analytics we’ll ask you to sign in. Then you’ll be asked if you want to accept this solution into your account and what Web Profile do you want to apply it to. After you select that it will be in your account and your own data will populate the report. We’re planning on expanding on this list of top solutions throughout the year so be sure to check back and see what we’ve added. A big thank you to Justin Cutroni & Avinash Kaushik for supplying many of the solutions currently available. A version of this post originally appeared on the Google Analytics Blog. in 2010 to provide you with the benefit of 24-hour account management while leaving you free to focus on other things. Looking across the web, search professionals have been sharing ways they’ve used automated rules to help manage their campaigns. 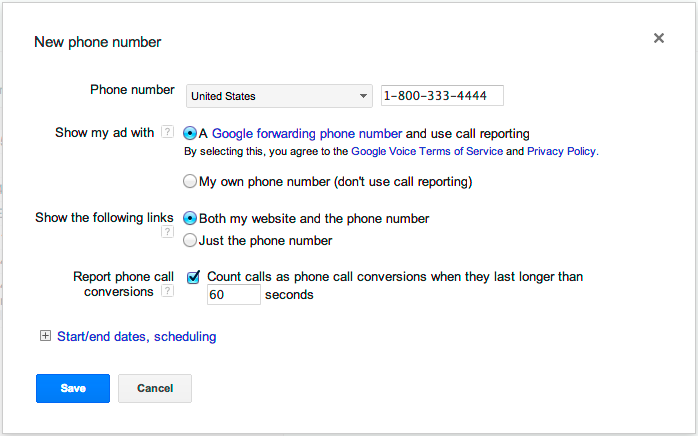 Automated rules are available to all AdWords accounts and if you regularly perform manual tasks in your account, we encourage you to give this feature a try. And once you’ve done so, we’d love to hear your feedback for how we can make automated rules even better. So do let us know how it goes! Marketers benefit when they have more time to think strategically and spend less time on repetitive tasks. We were excited when we launched automated rules in 2010 to provide you with the benefit of 24-hour account management while leaving you free to focus on other things.